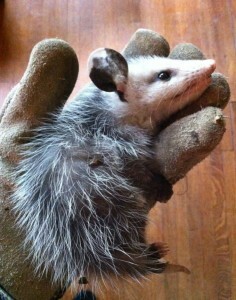 I hate that the only possums I get to hold are injured ones with little chance of survival. It ended up nestling deep into the towel for the night and this morning it’s in that same position — blessedly still breathing. I’m hoping Animal Advocates near the Fairfax District might have room to take possession of it today, but if not it’s back to the California Wildlife Center we go. UPDATE (4.25 3:41 p.m.): It was looking almost like a lost cause — not the opossum who continued its remarkable rebound — but finding a place to take it. Animal Advocates was at capacity, and I was further distressed when a call to California Wildlife Center ended also with a decline to help (due to having more animals than it could care for). It seemed like my only option was to contact the city’s animal services department, but that was a death sentence. Finally at the suggestion of Animal Advocates I called Coast & Canyon Wildlife in Malibu and they welcomed the little opossum (female) with open arms. Bless C&C Wildlife! This entry was posted on Wednesday, April 25th, 2012 at 7:30 am and is filed under adventure, animals, nature, updated. You can follow any responses to this entry through the RSS 2.0 feed. Both comments and pings are currently closed.